You may purchase this webinar individually, here. Introduce the endorsements that alter various cause of loss and valuation methods in the forms. This class is 25 minutes. Two of the questions answered by this class are: Who falls into each "level?" and When is protection granted to an "insured" within the specified "level?" What constitutes a "resident relative;"
Who can be added to the Homeowners Policy as an Additional Insured, the list may surprise you. This class is 15 minutes. The Homeowners Policy lists specific types of personal property and places a specific limit of coverage of such property – usually low compared to the actual exposure the insured has. Additionally, these "special limits" are WITHIN the Coverage C (personal property) limit not in addition to the limit. Such limitation can create an E&O trap for the agent. Lists the special limits that cannot be increased. This class is 10 minutes. 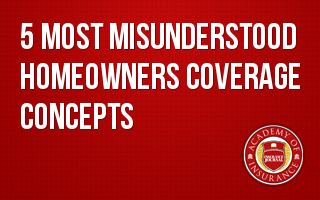 Explains what the insured must do to qualify for coverage under both endorsements.